Pompeii archaeological ruins are famous worldwide for being a unique example of a two thousand years old city frozen in times and the first ever documented natural catastrophe in history. This city was covered by the ashes of a sudden eruption on the 24th August 79 a.D. and it remained untouched up to the XVIII century when little by little it was brought to light. The city was probably founded by Oscans in VII cent. b.C. and for its strategic position it soon became reason of fightings between old inhabitants of the region: it was conquered first by Etruscans and later by Greek city of Cuma (525-474 b.C.). After the Samnite Wars it passed under Rome. During the Punic Wars remained faithful to Rome gaining importance and keeping its independence. On the contrary during the civil wars tried to resist to Rome, but Silla defeated it (89 b.C.). The past history ended August 24th 79 a.D. while modern history started with first excavations operated by Borbons in 1748. After the unification of Italy (1860) the works were entrusted to Giuseppe Fiorelli who also got the idea of the castings filling with plaster the empty spaces once occupied by the bodies inside the solidifyed ashes. 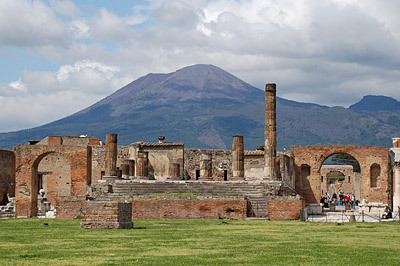 Pompeii today welcome more than 2.5 millions visitors a year. Monuments as the Forum, the Basilica, the Amphitheatre, the private villas and houses and all the other findings show us not only the physical places where the life took place, but allow also interdisciplinary investigations which satisfy any curiosity about the habits of what was an incredibly modern society, ‘till showing us private people’s stories.